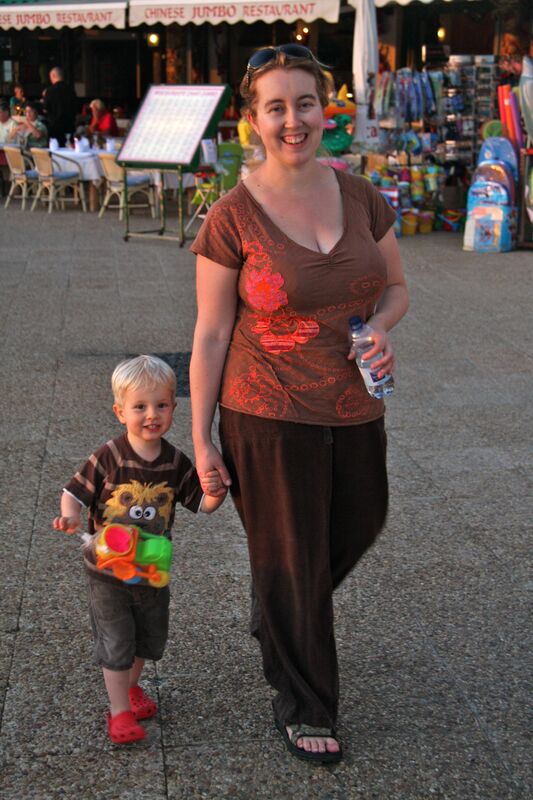 Kirsty and I had been to Lanzarote before we had children. We hadn’t intended to go: it was a last-minute stand in for Sri Lanka. We were due to fly to Colombo on the day the tsunami struck, so we required a sudden change of plan; as we were flying peak season (between Christmas and New Year), Lanzarote was all that was left. If we went sceptical, we came back enamoured. We love Lanzarote. It’s windy, wild but strangely beautiful – a landscape like no other that fascinates and surprises. The beaches are great, the architecture cool (thanks to Cesar Manrique) and for a dose of winter sun, with only four hours flying time and no time difference, it’s difficult to beat. With such positive memories, we had no hesitation in booking a week in the winter sun with Leo (2 and a half years old at the time) and Genevieve. Genevieve was just 3 months old – this would be her first foreign holiday – so we didn’t want to go too far. We also wanted something familiar and easy: Lanzarote ticked the boxes. We stayed at the Princesa Yaiza hotel in Playa Blanca, on the south coast of Lanzarote. I really can’t praise Playa Blanca highly enough for a holiday with young children. Although villa developments sprawl for miles, and it’s not exactly ‘historic’, the whole place is tastefully developed. Best of all is the traffic-free promenade which runs for miles along the seafront. 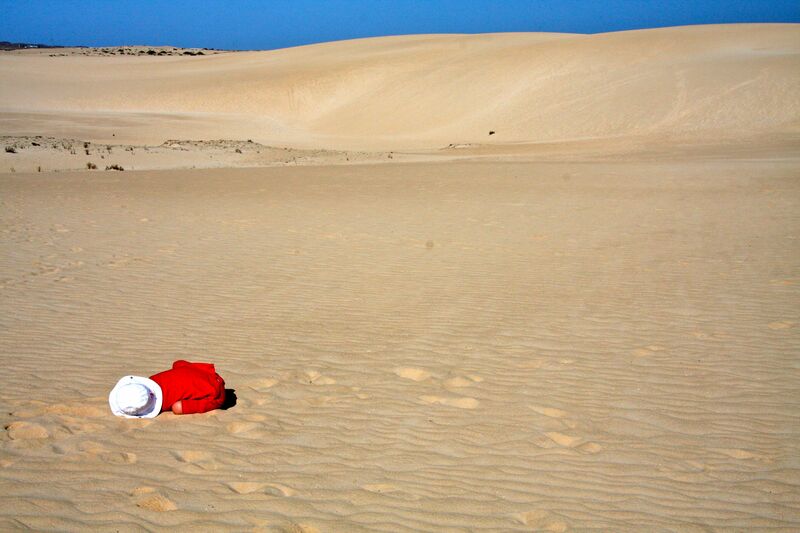 With no traffic and beaches, bars and restaurants along the way – together with views out to Fuerteventura – it’s a delightful way to spend nap time, incredibly buggy friendly and safe for any toddlers in tow. There’s a good selection of restaurants – we ate mainly in the ‘old’ fisherman’s village (not that old), along the waterfront. The Chinese there is good and we were getting out with full tummies for less than 30 euros! The resort beaches are fine – there are two main sandy ones that get fairly busy. You can rent parasols and loungers and there a breakwaters ensure calm seas. If you want something more wild, head to the stunning, undeveloped beaches of Papagayo – we didn’t on this trip but we spent happy days there on our first visit (NB: clothing on some beaches is optional!). The hotel: The Princesa Yaiza is fab. The one-bedroom suites there are designed with families in mind: bathrooms are huge, there’s a mini kitchenette to fix a bite to eat, a big king size bed for mum and dad and cots / camp beds for the kids, or sofa-beds in the lounge. We all slept in the bedroom, meaning we could sit in the lounge area after kids’ bedtime and watch DVDs without disturbing them. The breakfast buffet at the Yaiza is possibly the best we’ve had anywhere. Plus the facilities are great: shallow, warm pools for the kids, a soft play area, ‘Kikoland’ kids club (which we didn’t actually use). Plus – for ultimate ease – the sandy beach is right in front of the hotel; and you are straight onto the traffic-free promenade from the front gate, just a 5 minute walk from the central harbour area for shops and restaurants. For more, see my TripAdvisor review. 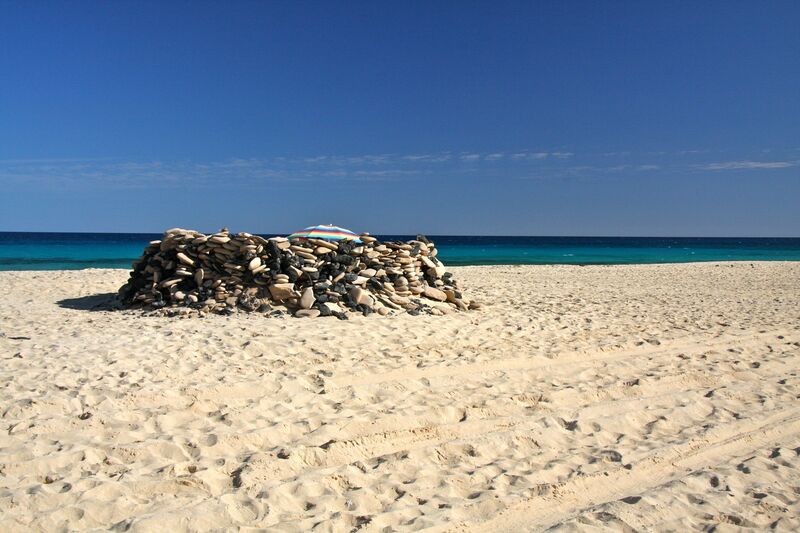 Day trip to Fuerteventura: A fun way to spend a day. Take the car and hop on the hydrofoil that goes from Playa Blanca to Corralejo in Fuerteventura. The crossing only takes 15 minutes but it’s an adventure for the children. Once there, head straight for the dunes, they are stunning. You feel like someone out of Lawrence of Arabia, trekking across them to the sea. Leo decided to be a grump in the middle of the dunes – which made for some lovely, memorable photos. The beach, when you get to the shore, is almost Caribbean – beautiful, clear turquoise waters. Take a picnic though – there’s nothing about. Lunch at Caleta de Famara: Go here if you do nothing else. Famara is stunning – the backdrop is not unlike Table Mountain, soaring, flat-topped cliffs soaring from the ocean. It’s windy and wild and there’s a long sweep of sandy, dune-backed beach. The village of Caleta, at the southern end, has something of a frontier feel about it; sandy streets and wind-swept, sunbleached houses. There are two restaurants on the harbour front that serve great food – fried cheese, fresh fish, little salty papas (potatoes) with mojo (spicy sauce). You can sit and tuck in whilst the kids run around on the beach in front. Lovely. The time difference: None! Perfect. No issues. 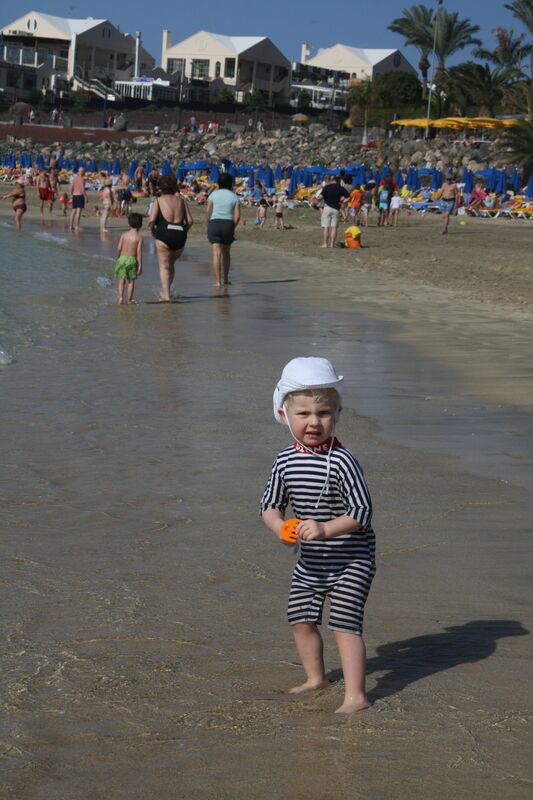 The water temperature: in the middle of winter, the swimming pools and sea are fairly fresh. We were really lucky with the weather, it was sunny and over 20 degrees each day. But it’s not guaranteed in the Canaries and Lanzarote on a grey day, with a chilly breeze, can loose some of its charms. I would really recommend staying in Playa Blanca; we stayed in Costa Teguise when we went as a couple – it is more soulless and the beaches aren’t as nice. Plus that promenade is a real winner. If you go in winter, be prepared for cool or cloudy weather. It would be unlucky to get a week of it, but a day or two is possible. With no warm clothes, it can get miserable. 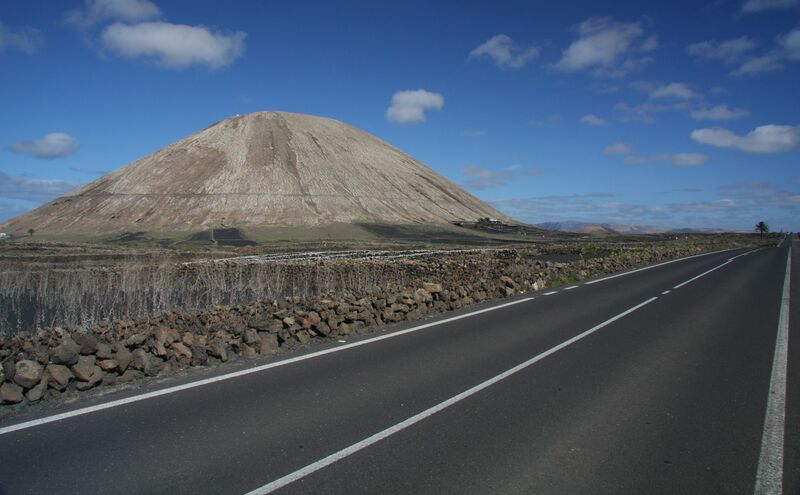 A popular trip is to visit the volcano, Timanfaya. We didn’t do this with our children and if you have kids 3 and under, I’d probably say don’t bother. Whilst the landscape is pretty amazing, you have to get on a coach (which you can’t get off until the tour is over). Young children in my experience don’t get that much of a kick out of looking at windows at strange rock formations – they’d rather be paddling in the sea! Or try the Cactus Garden instead – good for a run around on a non-beach day. 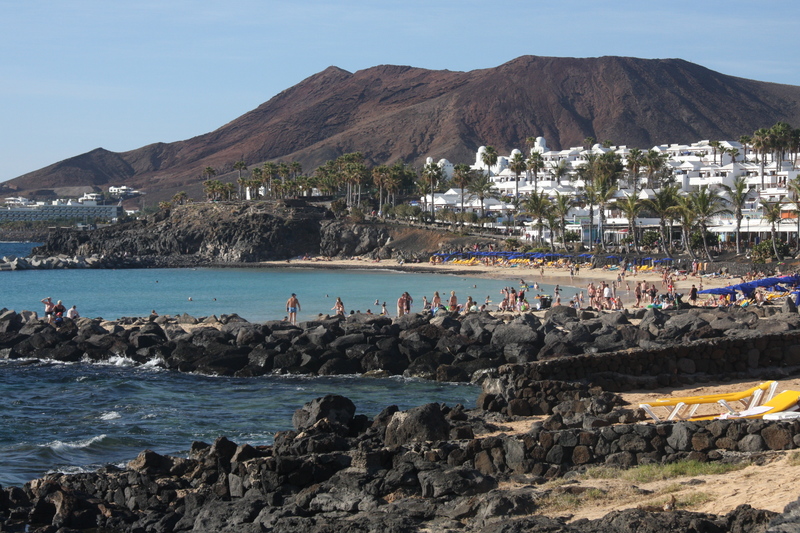 Lanzarote is a great choice for winter or the shoulder seasons. Personally, I wouldn’t go between May and October – I’d head straight for the Med, where you can get equally fabulous, if not better, beaches, more culture and better food for a shorter flying time. 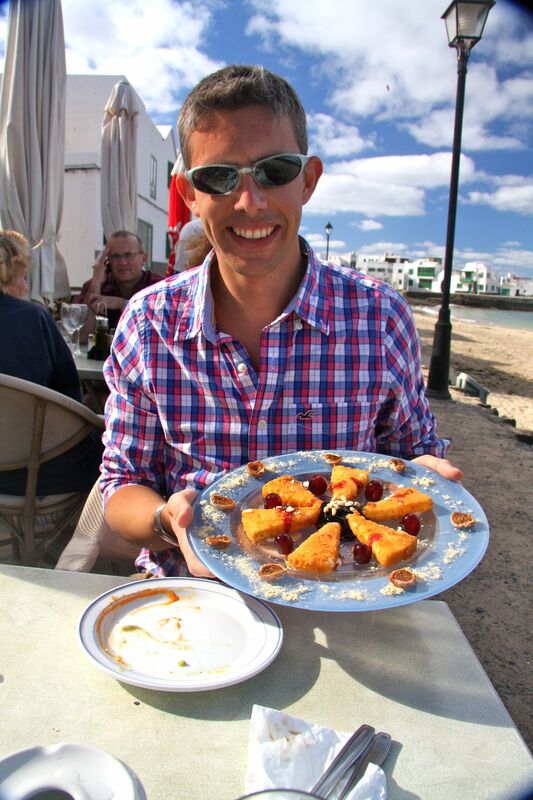 But for a dose of winter warmth, Lanzarote is difficult to beat. Even if it’s not boiling, just being out in the fresh air all day without three layers on is utterly rejuvenating. Now Leo is about to start school, and places with jet lag are off-limits for most of the year, I think Lanzarote will become a staple for us. This entry was posted in Destination guides, Europe and tagged accommodation reviews, family, family holidays, lanzarote, travel. Bookmark the permalink.